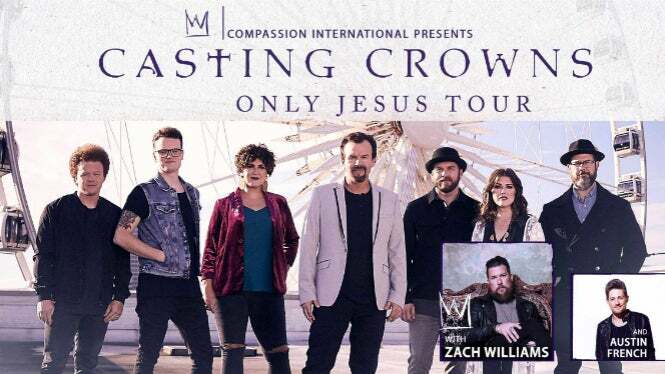 NASHVILLE, TN - As multi-platinum selling and GRAMMY® winning group Casting Crowns just released a brand new studio album, Only Jesus, the group announces the Only Jesus Tour, a 37-city spring arena tour run featuring fellow Grammy winner Zach Williams and Austin French. Presented by Compassion International, the Only Jesus Tour will support Casting Crowns’ brand new studio album, Only Jesus. Show Date/Time: Friday, April 12 at 7pm. Doors open at 6pm. On Sale Info: Tickets on sale Friday, December 14 at noon at the Target Center box office, online at TargetCenter.com or by calling 888-9-AXS-TIX.